USC leaders joined the men and women of the Los Angeles Fire Department (LAFD) and civic and community officials at a groundbreaking ceremony on Feb. 13 for the new city of Los Angeles Fire Station No. 15 near USC Village. Among the city leaders were L.A. City Attorney Mike Feuer, Councilmembers Curren Price, Mitch Englander and Fire Commissioners Delia Ibarra, Jimmy Hara and Jimmie-Woods Gray. Fire Station No. 15 services, currently located at 915 W. Jefferson Blvd., will be moved within a two-block proximity to 3000 S. Hoover Blvd., at the corner of Hoover and 30th Street. The new facility, sporting an Italian Romanesque design, will sit on an acre of land three times the size of the existing station and is scheduled to open in spring 2015. USC President C. L. Max Nikias thanked the city officials, acknowledging firefighters and first responders who have serviced the West Adams district for more than a century, and he expressed the university’s deep appreciation for their service. The new USC Village will feature a town square for the university and the community, with more than 2 million square feet of community-serving retail, student housing, and academic space. The Los Angeles City Planning Commission unanimously approved the USC Village design guidelines albeit a few modifications to descriptive terminology. 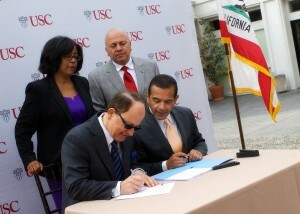 This important vote allows USC to apply for city permits that are needed to begin construction. USC would like to thank all of the community members and local business owners who attended the public workshop on October 29, 2013 and the public hearing on November 5, 2013 on the *Design Guideline Appendices, hosted by the City of Los Angeles. Lupe Garrido’s walk to the podium was the last stage in a journey from South Los Angeles resident to parent leader of USC’s flagship neighborhood academic enrichment program to proud supporter of a historic project. Speaking to a crowd of hundreds in the Galen Center Founders Room at the USC Village Appreciation Dinner on April 2, Garrido thanked community members for their participation in multiple USC Village community meetings and City Hall hearings over the past year. Parents, residents and business and civic leaders turned out repeatedly to express their needs and show their support for USC Village. The student housing and community-serving retail project is expected to create 12,000 jobs while changing the face of the university and South Los Angeles. Garrido’s son, Daniel, a senior at USC, is a graduate of the Neighborhood Academic Initiative (NAI), a seven-year program that offers college preparatory tutoring on the USC campus. He was awarded a full scholarship to USC. Daniel’s sister, a senior at Foshay Learning Center, one of the USC Family of Schools, is following her brother’s footsteps through the NAI. Their mother is president of the initiative’s Parent Leadership Board. Following Garrido’s keynote, Thomas S. Sayles, senior vice president for University Relations, expressed his appreciation to the community. In both English and Spanish, he thanked council members, labor, business and community groups, and the many residents who supported the project. “I feel so very fortunate to have this job, to work with all of you and to have an opportunity to continue to make this community what it deserves to be and what it is rapidly becoming,” Sayles said. City Attorney Carmen Trutanich was among the civic leaders in the audience, along with Jackie Dupont-Walker, president of Ward Economic Development Corp. and chair of the USC Specific Plan Community Advisory Committee, Michael Banner, president and CEO of the Los Angeles Local Development Corp., and Belinda Jackson, executive director of the Expo Center. The celebration closed with a musical flourish, courtesy of the USC Trojan Marching Band. The appreciation dinner came six days after USC President C. L. Max Nikias and Los Angeles Mayor Antonio Villaraigosa held a signing ceremony to mark the formal approval of USC Village. The Los Angeles City Council voted unanimously in favor of the project in December. The vote cleared the way for USC to redevelop large parcels of university-owned land over at least the next 20 years. By far the biggest project will be the renovation of University Village, a small and dated shopping center across campus on Jefferson Boulevard. The new USC Village will feature a town square for the university and the community, with more than 2 million square feet of community-serving retail, student housing, hotel and academic space. Most importantly for neighbors and students, USC Village will include a full-service grocery store, many shops and restaurants, and up to 3,000 new student housing beds (in the first phase, out of a total of 4,038 over 20 years), which are expected to relieve pressure on rental units in the surrounding area. “USC has always had a special relationship with its neighboring communities — working hand in hand, side by side, and standing the test of time,” Nikias said. David Galaviz, executive director of USC Local Government Relations, said: “Throughout this entire process, we placed a very high value on engaging all levels of community stakeholders. We knew that in order to move this project forward, we needed to engage early and often. “Going forward, we need to continue to collaborate with long-term supporters, listen and follow through on numerous aspects of this transformative project,” he added. For more information on the new USC Village, visit villagearchive.usc.edu. La Opinion reported that the Los Angeles City Council unanimously approved USC Village, a 35-acre project that will bring new retail, student housing and amenities to the community. KPCC-FM’s “OnCentral” noted that USC has agreed to extensive benefits for the local community, including the creation of 12,000 new jobs, 8,000 of which will be permanent. “As someone who remembers South Los Angeles when it was thriving economically, I am enormously proud to be part of a university that will bring thousands of good jobs, badly needed shops and restaurants, and a new center of community life to our neighborhood,” said Thomas Sayles, USC senior vice president for university relations. Curbed L.A. also featured USC Village, calling it one of the most notable Los Angeles development projects in 2012. The story stated that the redevelopment will bring to the community a grocery store, new retail, green space, and thousands of much-needed student beds. ABC Los Angeles affiliate KABC-TV, NBC-LA, Univision Los Angeles affiliate KMEX-DT, and The Chronicle of Higher Education also featured the historical vote. In an editorial published on October 30, 2012, The Los Angeles Times called the Village at USC a “smart step” on the university’s part, offering a good template for how to work together so that communities thrive. In addition to the student facilities, the university has agreed to give $20 million to a city fund to create and maintain affordable housing in the community around USC. If the university achieves the threshold of housing 70% of its undergraduates on its property, it will have to pay only $15 million into the fund. Everyone, from community groups to the university to the city, is pleased with this. The university has also pledged to hire 30% of the workforce for the project from within a five-mile radius of the campus. That includes both temporary construction jobs and permanent new jobs. Download PDF with maps and Spanish-language information. The Department of City Planning is hosting an Open House on the proposed USC University Park Specific Plan. The Proposed Specific Plan would allow for the development of various academic buildings on the USC campus, as well as student and faculty housing, and commercial uses in the University Village area that may include a grocery store, movie theater, retail, restaurants and a hotel/conference center. At the Open House, City Planning Department staff will be available to answer your questions and collect your input on the proposed Specific Plan, Development Agreement, and Nexus Study. Your input at the early stages of this project is critical in shaping a development plan that meets the needs of both the university and the community as a whole. The community is welcome to attend either Open House at any time during the hours stated above; there will be no formal presentation. Maps and handouts will be available. If you would like to review a copy of the Final Environmental Impact Report (FEIR) or the documents referenced in the FEIR, you may do so by clicking here or by visiting Room 750, City Hall, 200 N. Spring Street, Los Angeles, CA 90012. Please call ahead to make an appointment. Copies of the FEIR are also at the following library branches: Central Library, Exposition Park, Junipero Serra Branch Library, Vermont Square Branch Library, Jefferson Branch Library. The FEIRs can also be purchased on cd-rom for $7.50 per copy. To purchase a copy, contact Diana Kitching of the City of Los Angeles at 213-978-1342.